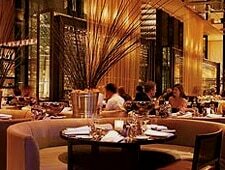 Beautiful restaurant and food that excels at the Hilton Sydney. : Chef-restaurateur Luke Mangan has been in charge of this showcase 240-seat brasserie at the Hilton Sydney for some time, and he knows what visitors to the city are looking for. As the name suggests, sparkling glass features prominently in the design, making it the ideal stage for Mangan to display his skills. Together with chef Joe Pavlovich, he offers à la carte and dégustation menus featuring signature dishes such as hiramasa kingfish sashimi with ginger, eschalot and Persian feta; an organic egg omelet of blue swimmer crab meat or enoki mushroom with herb salad in a miso mustard broth; and pan-fried potato gnocchi, corn, asparagus, zucchini, Parmesan and lemon thyme. Meat-lovers will go for the meat tray from which they may choose their cut for the grill. To end a meal, the only thing better than the sticky date soufflé, butterscotch and malt ice cream is a dessert plate to share. The extensive and wide-ranging wine list, from head sommelier Mauro Bortolato, rises to the occasion with old- and new-world selections, many offered by the glass.